They are an annual plant that grows in the pool and along the forest road in a submontane district and forests on a hillside. The stalk is circular in cross-section and short soft glandular trichome grows in clusters and many are tinged with red-purple. The stalk is circular in cross-section and white soft glandular trichome grows in clusters with the top split in many cases. On spikes (Kasui: small flowers gathering to be like head of plant) about 10 to 15 cm long, pale purple-tinged flowers whorled. 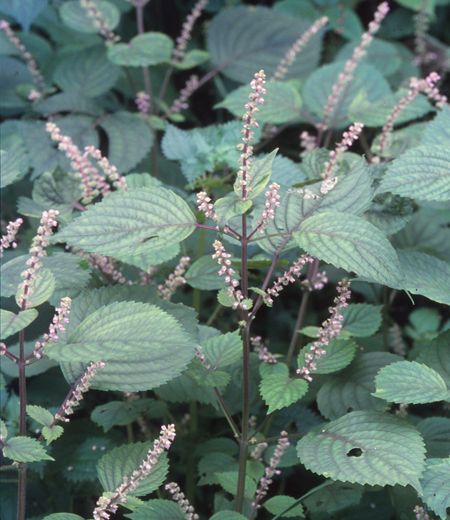 When you knead the leaves, they smell like lemons, and also the appearance resembles the one of Perilla frutescens (L.) Bitt.var.frutescens. This is why they are named. This is the plant that was first discovered in Mt. Takao in 1913. The flower is pale showy pink about 5 millimeters long, and blossoms on inflorescence (Kajo: stalk blooming flowers) grown from the top branch, about 10 to 18 cm long. The leaf is wide egged-shaped about 7 to 12 cm long, 5 to 8 cm wide, grows alternative on the stalk. The veins have soft paraphyllium, the Glandular point stands out at the back, and the same shaped sawtooth (Kyoshi: tooth-like rough part like a saw at the root of a leaf) along the edge. Calyxes growing white long trichome bear the seeds, which grow to be about 6 to 7 mm large in diameter and hold the seeds.